EMERGENCY STROBE� is a powered by one "D" cell alkaline battery (not included) which will allow it to flash at 60 to 70 times per minute for up to 16 continuous hours and then at a diminished flash rate for up to a total of 60 hours. This emergency strobe light is visible for up to 3 miles, depending on atmospheric conditions. It easily attachs to a backpack, belt or Personal Flotation Device by its stainless steel locking pin. It is U.S.C.G. and S.O.L.A.S. approved as a PFD/Safety light, and is an ideal accessory product for all outdoor activities. "Making others aware of your location", can be a very valuable lifesaving benefit in a variety of situations on land or on the water. 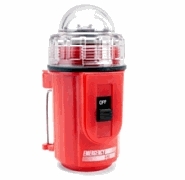 The magnetic "reed" on/off switch, waterproof case, hard acrylic lens cover and powerful xenon bulb make this emergency strobe a very unique safety product. Perfect for scouts,campers, hunters, boaters, hikers, XC-skiers,outdoors enthusiasts of all kinds. Mark game or your campsite to easily return. Helps keep predators away.